I might be a smidge competitive. When my husband mentioned a fabulous chicken enchilada chili he ate for lunch when his work had food catered in from a local restaurant, I got jealous. My husband rarely gets excited about soup (he said it had the consistency of soup, though it was called a chili), and rarely does he mention a meal multiple times. In the same night. So I started to grill him all about the ingredients, the flavors, even the color of the soup. Then I started to brainstorm. And research. And try to recreate that darn soup that my husband seemed so in love with. Trying to recreate a soup you've never tasted yourself may not sound like the brightest idea, but as I said, I'm a smidge competitive. And luckily my husband didn't mind trying the many versions of a chicken enchilada chili that I put in front of him in the course of the next couple weeks. In the end, this one turned out to be the winner. While my husband says it is thicker and has more chicken and veggies in it than the original, he also says that he might even like it a bit better for it. Did you hear that? Better. I win. Yep, just a smidge competitive. And really, how could I not, with a combination of flavors like this. 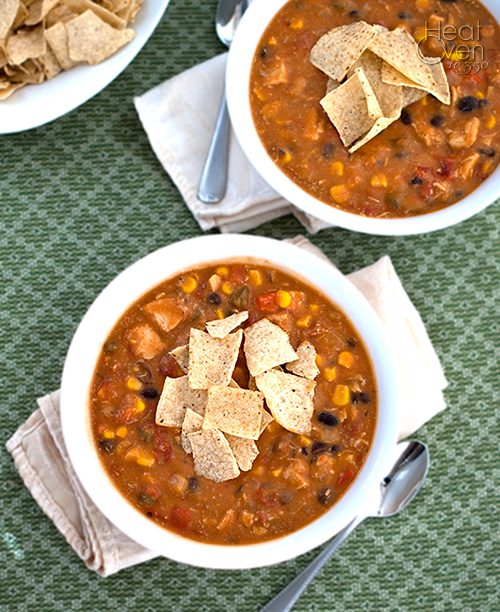 It's like cheesy chicken enchiladas in a soup form. The enchilada sauce shines through, and there are plenty of chicken chunks and southwestern veggies. The cheese is what makes this recipe, which is unfortunate for my waistline but delicious just the same. It adds a thickness and richness that goes so well with the enchilada flavor. It is a fast soup to make, which is always nice, and the leftovers the next day are just as good or maybe even better. In a large Dutch oven or stock pot, melt butter over medium heat. Add onion and green pepper and cook until onion is softened, about 5 minutes. Add flour and cook and stir an additional 1 minute. Slowly stir in chicken broth, whisking out any clumps after each broth addition. Stir in black beans, corn, diced tomatoes and enchilada sauces. Bring to a boil, reduce heat and simmer, uncovered, 15 minutes. Stir in cheeses and chicken breast pieces and cook until cheese has melted and chicken is heated through, about 3 minutes. Season to taste with salt. 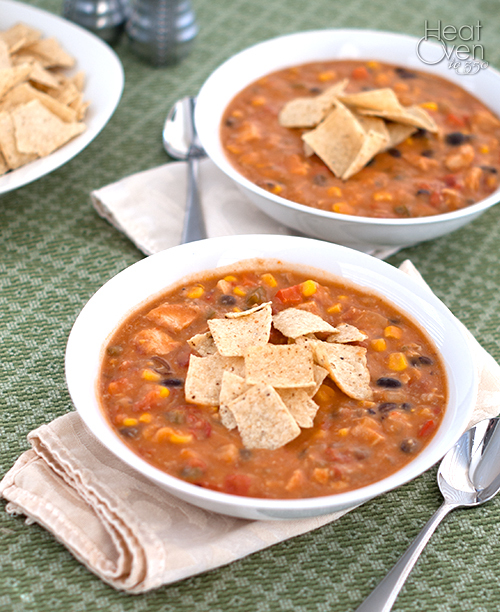 Serve with crushed tortilla chips on top. Looks awesome! I'm so glad we get reap the benefits of your competitiveness! ;) Can't wait to make this! That looks amazingly delicious!!!! Cannot wait to make this one. That is my kind of soup! I'll never forget one of the first meals I made for my husband was homemade chicken noodles soup - made my own chicken stock and noodles, baked a fresh loaf of bread, and herbed butter. He loved it! I took the dishes to the kitchen, cleaned up and asked what he wanted to watch on t.v. and he was like "what's for dinner?!" It was then and there I learned the soup is not an entree!